Amazon.com description: Product Description: Blackstone's Custody Officers' Manual is an essential reference and training resource for all custody officers and trainers. All relevant legislation is presented in a clear and concise manner, together with analysis and explanation of the areas of the Codes of Practice that are most commonly misunderstood, to offer a comprehensive treatment of all elements of the custody officer's role. Professionals involved in the criminal justice system will be acutely aware of the ever-changing legislation that governs the reception, treatment and welfare of people detained at police stations. This book interprets the Police and Criminal Evidence Act 1984 and accompanying Codes of Practice, and also covers detainees' entitlements, reviews and relevant times, identification and samples, as well as the extension of detention in terrorist cases. The fifth edition contains revised material on safer detention, clinical treatment and attention, and identification and samples, and is fully updated to cover all recent legislation, including the Terrorism Act 2000, the Criminal Justice Act 2003, and the 2012 updates to the PACE Codes of Practice. 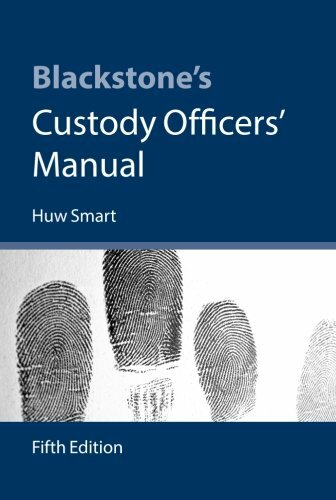 Presented as a step by step guide to all stages of the custody procedure, Blackstone's Custody Officers' Manual highlights common problem areas and offers practical guidance using real life examples, flowcharts, and summary sections.